We added Grapefruit Essential Oil to our Pure Organic Shea Butter. 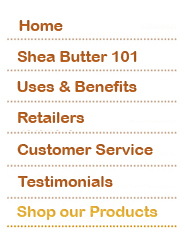 This Grapefruit Shea Butter is an all-over revitalizing moisturizer with the zesty grapefruit fragance. Grapefruit Essential Oil has a citrus, uplifting scent, and is rich in antioxidant Vitamin C which leaves skin toned and refreshed. Great for dry, mature skin. Also great for the scalp for hair growth. Ingredients: 100% Pure Organic Shea Butter, Grapefruit Essential Oil.